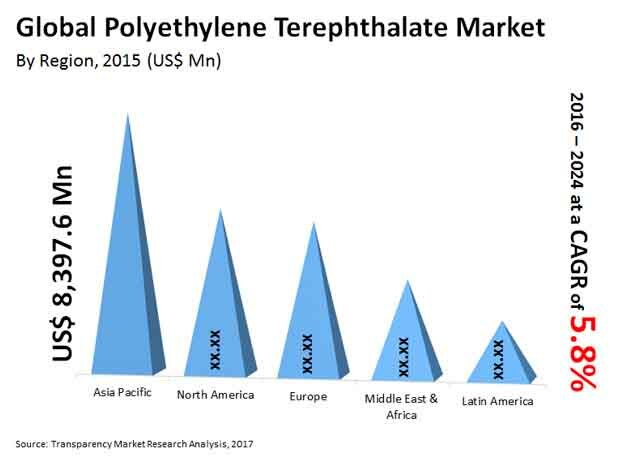 The global polyethylene terephthalate (PET) market has been predicted by Transparency Market Research (TMR) to bear a significantly fragmented characteristic due to the presence of several industry players. According to a market research publication penned by TMR, five companies, viz. DAK Americas, Octal, Jiangsu Sanfangxiang, M&G Chemicals, and Indorama Ventures, had secured an aggregate approximate share of only 39.0% in the recent 2015. In the next few years, the market could testify an intense level of competition due the enormous count of PET resin suppliers and low switching expenses. As per the TMR report, the global PET market has been anticipated to earn around US$39.16 bn by 2024 from US$23.73 bn in 2015 at a 5.80% CAGR for the forecast timeframe 2016–2024. By application, beverages could remain as a dominant market for PET. By region, Asia Pacific has been foreseen to rise with a higher share, considering its over 35.0% share achieved in 2015. Players operating in the global PET market have been expected to make continuous efforts to introduce new offerings for cementing their position with a handsome share in future. Furthermore, expansion could be a prime strategy adopted for achieving full chain margins, lowering operational expenses, and improving global capacity share. For instance, in 2015, Reliance Industries Ltd. (RIL) had publicized the commissioning of PET resin plant of 650 KTA capacity and purified terephthalic acid (PTA) capacity of 1,150 KTA in Gujarat. These plants could apparently be put to operation for preparing polyester plastic used in plastic bottles, foods and beverages, packaging, and clothing. The world PET market has been projected to exhibit a highly dynamic nature throughout the course of the forecast period. The growth of the market could be impacted positively with the latest trend of the replacement of conventional glass packaging with PET packaging. According to the authors of the report, the market could gain a telling impetus on the back of the high recyclability of PET. Products such as raincoats and carpets which do not require virgin PET have been forecasted to make the best use of the 100.0% recyclable property of PET packaging. Most of these packaging could be reused by manufacturers. In this regard, companies have been envisaged to receive high profit margins in the coming years. Moreover, the demand for PET products could augment further, especially in emerging regions, ensuring a strong market growth in the near future. The international PET market has been envisioned to face restrictions in its growth with the implementation of tight government regulations and intense volatility in the prices of crude oil. However, there could be attractive business opportunities birthing from the surging demand for packaged food bolstered by the growing consumption of processed and frozen food. The demand for PET in the food and beverage sector on the part of carbonated soft drinks packaging has been prognosticated to bode well for the market. Factors such as eco-friendly substitution and the elevating demand for automotive and electronics applications could unveil new avenues for players. Besides these, strong economic growth, innovative packaging, and rapid urbanization have been prophesied to drive the growth of the market.